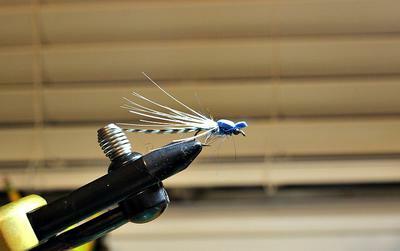 Readers of this blog may recall that I wrote an article some months back about tying a simple blue damselfly. I was motivated to try this pattern after seeing how often fish smacked adult damsel and dragonflies on the water during spring and summer. Texas has about 70 species of damselflies and nearly 160 species of dragonflies, so it just makes sense that they comprise a significant portion of a fish’s diet. I had to work to come up with a version I could tie, however. I possess only rudimentary fly tying skills, and most of the adult patterns I found were too complicated for old fumble-fingers here. Anyway, I was eventually able to adapt some tricks and techniques that I found on-line, which enabled me to tie an adult damsel/dragonfly that might pass inspection. But, it was winter . . . Not the right time to try this warm-weather pattern! Spring has now sprung in Central Texas, so I headed out to a local creek that’s covered with vegetation and dragonflies to see if my new pattern worked. What a wonderful morning! There’s something special about seeing even a small fish smack a dry fly, and I was able to land several dozen in just a couple of hours. I used the Suntech Keiryu Special 27, which is the forerunner to the Traveler 27 that is such a marvelous pole for tight quarters. It turned out to be the right choice. 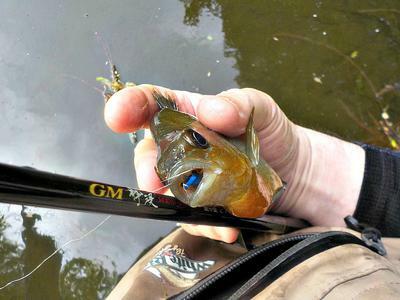 Can there be many things that are more fun than using a fine Japanese tenkara rod, with a dry fly you’ve tied yourself, when the fish are cooperating? I did learn a couple of interesting things. First, I figured that an adult damselfly/dragonfly imitation would be a dry fly pattern only, and that as soon as it became waterlogged, you needed to treat it with floatant and start over. That turned out not to be the case. Just as I’ve discovered with the venerable Elk Hair Caddis, sometimes the pattern works just fine when it gets waterlogged and sinks. 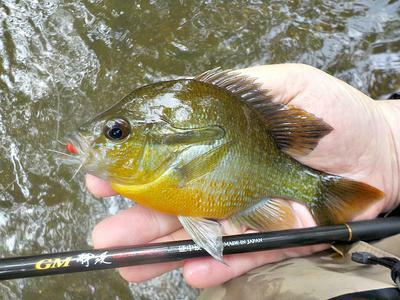 In fact, I’d say that nearly half of the fish I caught struck after I jerked the fly underwater. Interesting, huh? Also, I learned that the fish varied widely in how they approached the fly. Sometimes, I fished a dead drift, and it was 20 or more seconds before the fish struck. Any extra movement of the fly turned off these fish. At other times, as mentioned above, a quick jerk underwater triggered a strike. Occasionally, a gentle twitch was all that was needed. And, a few times, a wildly-erratic jiggle on the surface did the trick. Fish are not that predictable. If you’ve never tried an adult dragonfly or damselfly, give it a shot. You can google “Simple Blue Damselfly Tenkarabum” to find my earlier article and easy recipe. Happy fishing! And can we get a round of applause for the Keiryu Special 27?! 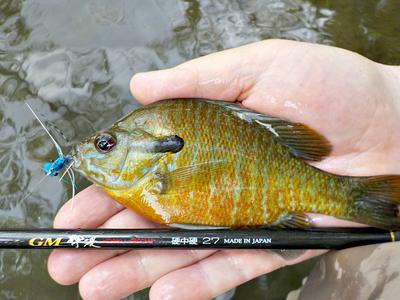 Such a fantastic rod! I love it. Thanks John!!! There is something special about catching fish on flies you have tied yourself. I enjoyed the dragon flies when I was in Texas. Especially admired a particularly large one with a black body and beautiful white wings. Excellent rod and an excellent blog! How about a pattern for that good looking fly? Thanks for the comments, fellows! For an explanation of the simplified pattern, google up "Simple Blue Damselfly Tenkarabum" and you'll find my earlier post about how to tie the fly. I'm kind of the test case on these patterns. If I can tie it, pretty much anyone can. It's a fun fly to tie. The only change I've made in the pattern is that I now tie the wings with a more natural colored coq de leon feather instead of the pure white one that I used in the original post.